Bart Gazzola has written for Canadian Art, BlackFlash (where he was Editorial Chair for three years), Magenta, PrairieSeen, Galleries West, Omnicity, and HA&L. For nearly a decade on the Prairies, Gazzola was both the art critic for Planet S Magazine and host / producer of The A Word on CFCR 90.5 FM. 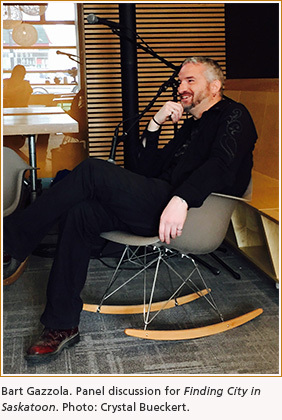 Since his relocation to Southern Ontario in 2015, he has become a regular contributor to The Sound: Art & Culture in Niagara; has collaborated on a project with Brock University's ti< Un journal de critique / creation texte - et - image; and written a catalogue for the Montréal exhibition Jouissance. A feature on Gunilla Josephson’s Houses & Whispers is in the current issue of U.K. magazine Long Exposure, and On Leaving [paris of the prairies] was part of Anna Szaflarski’s most recent LTTE collaboration, Augmented Reality. He’s recently completed a six part series on the controversial plans by Brock University in St. Catharines regarding Rodman Hall Art Centre, all available at thesoundstc.com.